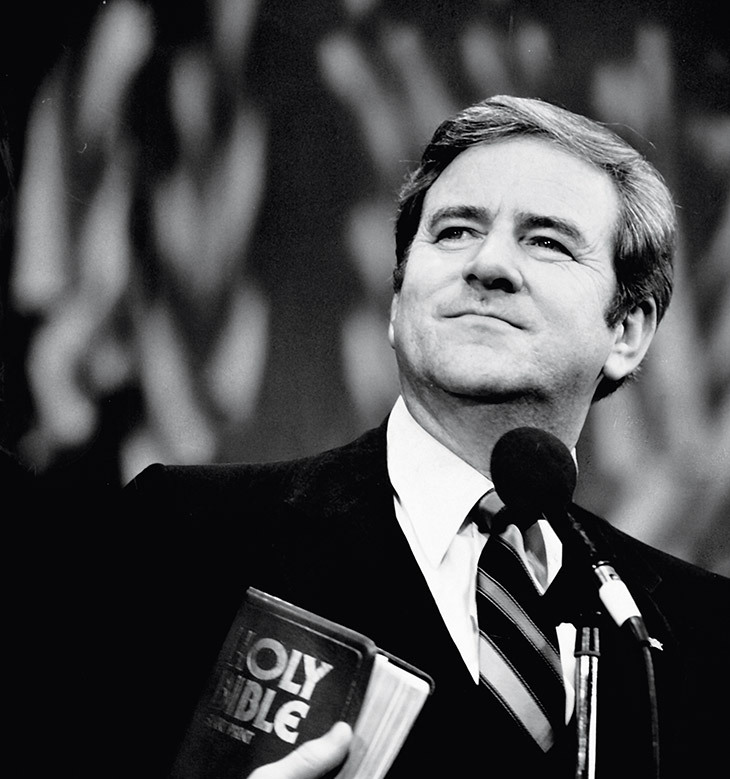 Most Christians remember my father, Jerry Falwell, in two ways: as an innovative pastor with a passion for the Gospel, and as a powerful political motivator who led the Moral Majority in the 1980s. That group was influential in electing Ronald Reagan as our nation’s 40th president, primarily by awakening the “sleeping giant” of conservative people of faith who desired to see political and social change in our nation. Dad made it abundantly clear that his first calling was to preach the Gospel. But God also placed a calling on his life to be a point man who voiced the concerns of millions of Americans in a variety of media and debate forums. I believe the Christian community greatly misses him in this regard. In October 1996, Dad preached a message from the Thomas Road Baptist Church pulpit titled, “Five Biblical Principles for Christian Voters.” There was much wisdom in that sermon, and so I have been challenged to try to recapture its essence, using his notes, in presenting a similar appeal to this generation of Christians. “And He said to them, ‘Render therefore to Caesar the things that are Caesar’s, and to God the things that are God’s'” (Matthew 22:21). “Therefore I exhort first of all that supplications, prayers, intercessions, and giving of thanks be made for all men, for kings and all who are in authority, that we may lead a quiet and peaceable life in all godliness and reverence. For this is good and acceptable in the sight of God our Savior” (1 Timothy 2:1-3). This is sometimes a difficult task. We get discouraged by what’s happening in our nation, and we want to throw in the towel instead of getting on our knees. If Christians would fervently pray for our nation and its leaders, what would happen in the hearts of lawmakers for whom they prayed? Honestly, I don’t know. But I would sure like to see what God might do in the hearts of our leaders if His people were truly committed to obeying 1 Timothy 2:1-3 and the other Scriptures examined herein. We do ourselves and our nation a disservice by not believing that God can act in the hearts of our leaders when His people are being obedient and prayerful. “Let every soul be subject to the governing authorities. For there is no authority except from God, and the authorities that exist are appointed by God. Therefore whoever resists the authority resists the ordinance of God, and those who resist will bring judgment on themselves. For rulers are not a terror to good works, but to evil. Do you want to be unafraid of the authority? Do what is good, and you will have praise from the same. For he is God’s minister to you for good. But if you do evil, be afraid; for he does not bear the sword in vain; for he is God’s minister, an avenger to execute wrath on him who practices evil. Therefore you must be subject, not only because of wrath but also for conscience’ sake. For because of this you also pay taxes, for they are God’s ministers attending continually to this very thing. Render therefore to all their due: taxes to whom taxes are due, customs to whom customs, fear to whom fear, honor to whom honor” (Romans 13:1-7). We see in this passage that it is God who raises up rulers and leaders. In John 19, we see Jesus telling Pilate that he would have no power at all if it were not afforded to him from on high. The believer lives under the law and the leaders God sends us. But as the Liberty Bible Commentary writers note, “The Christian always lives in a tension between the two competing claims of obedience to the state and obedience to God. … However, the believer dare not blindly bow to the state if his conscience is offended by the wickedness of the state.” A recent example of this came last year, when the Department of Health and Human Services announced that private health insurance plans must cover abortion-inducing drugs and devices. This affected many faith organizations that are pro-life. When our Bible-based beliefs are challenged, we have an obligation to speak out and conscientiously object. “Righteousness exalts a nation, but sin is a reproach to any people” (Proverbs 14:34). We see in this verse that righteousness exalts, or elevates, a nation, but sin brings down a nation. This is a frightening passage when we look at the obsession with sinfulness in our culture. When we look at our nation, we see why we need to support candidates who embody and favor: the biblical family structure (Genesis 1:26-28; 2:24); the sanctity of human life (Psalm 139:13-16); the biblical work ethic and thrift (2 Thessalonians 3:10); personal lifestyle character (Ephesians 4:24-28); and equal respect and opportunity for others (1 Corinthians 13). Imagine how our nation would look if we had leaders who would embrace these principles in their lives and their leadership. It is up to us to elect such leaders to office. “If My people who are called by My name will humble themselves, and pray and seek My face, and turn from their wicked ways, then I will hear from heaven, and will forgive their sin and heal their land” (2 Chronicles 7:14). This is the ultimate passage for how we, as followers of Jesus Christ, should be living. This verse is a call for holy living (personally and collectively), humility, prayer, dependence upon Almighty God and the off-putting of sin. It means we need to be serious about how we live. The passage also bears a wonderful promise: if we behave in the way God has designed for us, He will pour out blessings that we cannot hope to imagine. God wants to heal our nation. But America needs a spiritual awakening. That awakening surely will not come about because of the November elections. It will come about only when God’s people take seriously the principles of 2 Chronicles 7:14. Only then can our nation experience true glory. I noted that my father had a primary calling to preach the Gospel. I believe that is true of all followers of Jesus Christ. But we are also Americans, and we live in this land that was founded on godly principles by men and women who valued the authority of the Almighty. I believe this nation was a gift of God and we, as His followers, have an obligation to stand up for righteousness, live holy lives, always point to Jesus as the solution for our nation’s needs, and to vote for biblical truth. The sleeping giant of the church is desperately needed again. Scripture quotations are taken from The Holy Bible, New King James Version. Jonathan Falwell is senior pastor of Thomas Road Baptist Church in Lynchburg, Va.
Will God Still Bless America?